The Template plugin is easy to implement (check further down and documentation), but by default the template is inserted where the marker is. And I wanted the template to be added at the end of the document. 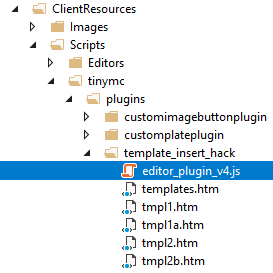 I looked into adding a new “insert after”-button on template-plugin UI, but that wasn’t doable. Tag the html-templates and use the BeforeSetContent-event to hi-jack the pipe with your logic. So, in the HTML templates I did start with a data attribute “<div data-insertafter” meaning it should have that behavior.